A view of the interior of Canterbury Cathedral. 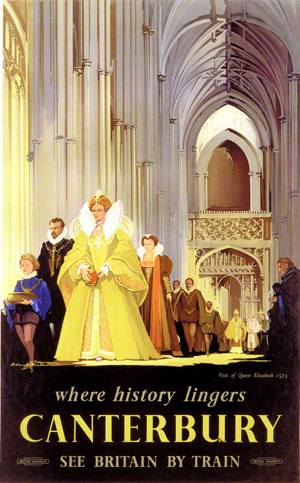 The visit in 1573 of Queen Elizabeth I to Canterbury Cathedral from a railway poster by Claude Buckle. Queen Elizabeth I visits Canterbury in 1573 and entertains the Duke of Alençon at the Crown Inn, perhaps considering -- then rejecting -- marriage to the gentleman. Canterbury's most infamous crime, Archbishop Thomas Becket was murdered within Canterbury Cathedral on orders from King Henry II. The ‘Where history lingers’ poster series captured images of Canterbury, Winchester, Hampton Court and Salisbury. Created in 1930.